Today, I have a Bloom by Bloom Stamp Set #148820 image on glossy cardstock colored with Stampin' Write Makers! Be sure to scroll down and check my last post for tips on creating a Sunrise/Sunset! I trimmed the front layer and added the narrow glossy strip to the inside for a surprise! The flower is stamped with Jet Black Staz-On Ink #101406. Try GLOSSY cardstock #144240! It's fun!! Shop here & EARN during Sale-A-Bration Promo! This cute BOLD stamp set is BLOOM BY BLOOM #148820, also available in a bundle with punches. I'm always wondering what my finished card would look like in another color. I had time to "play," because that is what I get paid for!! Colors are: Flirty Flamingo, Lovely Lipstick, Mango Melody and Gorgeous Grape. Base card is Basic Gray. Which is your fave card?? 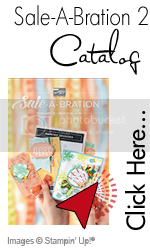 It's the BEST time of year - SALE*A*Bration!! New Occasions Catalog & S*A*B Brochure in the right sidebar.